The Blade Manufacturing Co. was founded in 1946 by brothers Charlie, Frank and Steve Callahan. 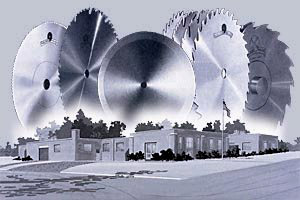 The company’s goal was to produce the finest circular saw blades made in America. That core value is represented today as the company is in its third generation of family ownership. In 1929 Charles Callahan was hired by The Olen Bishop Saw Company in Columbus, Ohio which at the time was one of the big 5 saw manufacturers in America. The “Great Depression” was a very difficult time and Charles always considered himself very fortunate and grateful to have a full time job. By 1931 Charles and four other associates had begun to discuss opening their very own saw company. In that same year, spearheaded by Charlie Callahan and Bernie Hodapp, they founded the Peerless Saw Company. Frank would later join the company as a sales representative. After a diligent hard working decade the company was thriving. In 1945 Steve returned home after serving in Europe during World War II. Early in 1946 the brothers realized a great opportunity to start their own business. In the summer of 1946 The Blade Mfg. Co was officially off and running. The small building on West Third Avenue that served as a machine shop during the war was picked to house the start up. The original company checkbook is still in tact with the first checks written out to Army Surplus for a gear cutter, punch press, drill press and various shop tools. Files were also purchased to add the fine cutting edge needed to make premium saw blades. The company was managed by Charlie while Frank hit the road. Frank traveled mostly by train all over the Midwest and East coast setting up distribution and manufacturers reps. In less than three years expansion was needed. In addition to the original building a second lot was originally purchased with expansion in the plans. In 1948 construction began to double the working space and add an in house heat treat system. The heat treat system provided the opportunity to expand from just wood cutting saw blades to include metal cutting High Speed Steel Blades. The ability to produce custom high speed saw blades continues to be one of the company’s greatest assets. The early 1960’s provided another growth opportunity with the inception of Carbide Tipped Saw Blades. At the time, carbide tipped blades were very bulky and unrefined but were slowly starting to be accepted for their increased cutting life. As we now know carbide tipped saw blades proved to be a milestone in saw blade technology. The addition of carbide tipped blades fueled growth. The Blade Mfg. was well known for quality industrial saw blades and no doubt had its designs and blade geometries duplicated through the years. Frank’s two sons Mike and Tom joined the company in the early 1960’s. Mike ran the purchasing and managerial side of the company and Tom worked in sales. In 1986 Mike and Tom purchased the company becoming second generation owners. A few years later the third generation started working primarily in the summer doing anything from stuffing catalogs to sweeping floors. Mike’s kids Michelle and Marc continued on through the 1990’s. Today the company is proud to be in the third generation of ownership as Marc purchased the company in 2004. While maintaining the core values of quality industrial saw blades and strong customer relationships we’ve expanded our product lines and sharpening capabilities. Years of experience, skilled knowledgeable employees and state of the art machinery have allowed the company to continue offering industrial quality saw blades and sharpening.